DrainBoss fixes blocked drains and carries out CCTV drain surveys, drain repair, and blocked drain clearance in Brighton and surrounding areas. DrainBoss is a Trading Standards approved, family-owned, independent drain company and emergency plumbers located in Brighton. We provide a fully comprehensive and personal service and don’t pay large franchise royalties – this means we can pass these savings onto our customers and retain the best possible service. We provide a professional and honest service with no call-out fee. All our services are fixed to a set pricing menu which you agree before work is carried out and, as part of our price promise, if you find a cheaper price elsewhere, we promise to try and beat it. We are CHAS accredited and trained to City & Guilds and Water Jetting Association standards so you receive the highest standard of plumber to ensure a fast and efficient drain clearance. 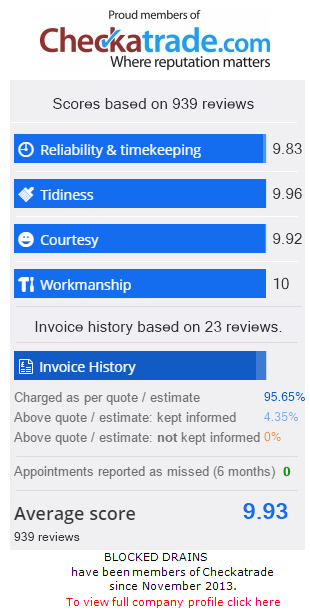 We have an excellent rating on Checkatrade, and our reputation is testament to our determination to stand out from any competition as the only affordable emergency plumbing service in the area. Our expert team is fully qualified, equipped, and trained to unblock all drains.There is no drain that our plumbers have not been able to unblock and we utilise the latest technology to complete the job as quickly and effectively as possible. You can trust us to provide a reputable and reliable drain unblocking service. DrainBoss unblocks drains in Brighton and surrounding areas including Hove, Rottingdean, Saltdean, Falmer, Stanmer, Portslade, Lewes, Shoreham, Peacehaven, Hamsey, Offham, Cooksbridge, Plumpton, Westmeston, Ditchling, Clayton, Pyecombe, Poynings, Saddlescombe, Fulking, Edburton, Small Dole, Oreham Common, Woodmancote. Call DrainBoss at 01273 921789 now if you’re concerned with blockages in your drainage system. We operate 24/7 and have the capability, skill, and expertise to deal with all types of blocked drains and plumbing situations.